Unofficially marking the end of summer in Canada, the Labour Day long weekend has arrived. The sun is setting earlier, and rising later. Evenings are cooler. The pace at work will pick up come September. And of course, kids only have three more days of vacation before they report to school. Here at Salt + Light we will also be sending off to school some of the kids that have become part of our family this summer. 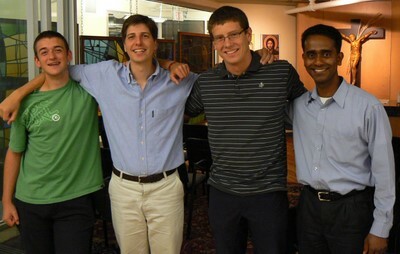 Okay, they're not kids by any stretch of the imagination, but seminarians (L-R) John Moss, Stefano Cascio, Bryan Duggan, and Pio Sebastiampillai have become part of our family. John and Bryan, who will return to Mission, B-C, introduced themselves to readers with a blog last week. Stefano, who is studying in Rome for the Diocese of Rome, has been working primarily with the French department, and focusing on the French broadcast of Zoom. Pio, studying for the Archdiocese of Toronto, has been working patiently and diligently with all our online initiatives and content, and online Focus episodes and Zoom editions have his fingerprints all over them! It has been a pleasure to work with these four young men -- they have worked very hard, have been very reliable, and have been an integral part of the Salt + Light family for the last few weeks. We wish them all the best in their studies for the priesthood, and pray that, God willing, they will one day return to Salt + Light and offer Holy Mass for us! God bless you John, Stefano, Bryan, and Pio -- you have our best wishes and prayers!